Found a great article from Sauder Business School – UBC on 24 hours News. 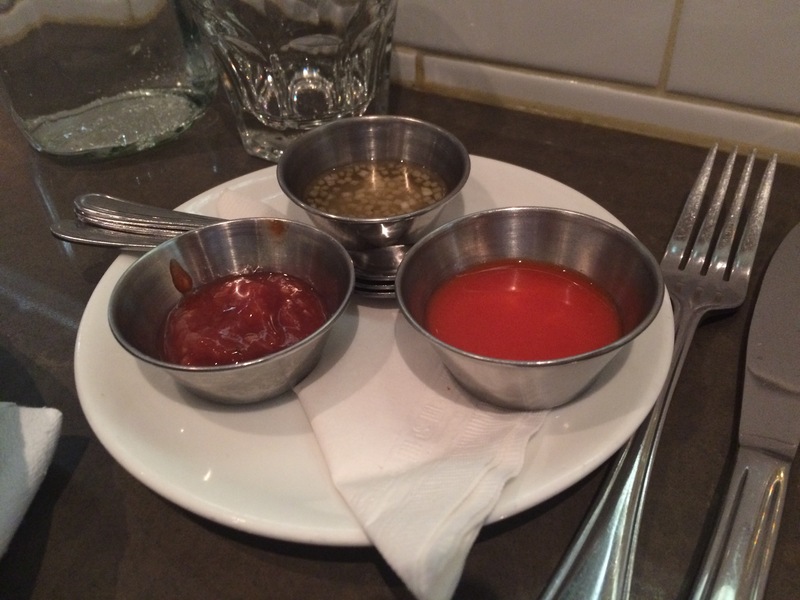 This is exactly what drove me to food reviews as it is a tool I have always used. Further to that you get to know different writers in different areas who you feel are honest and real to their word reviewers with culinary knowledge. It’s your first time travelling to a new place — say, Vancouver — and you’re looking for somewhere to eat. And since you don’t have anyone to ask, chances are good the search will take you to a food review website. 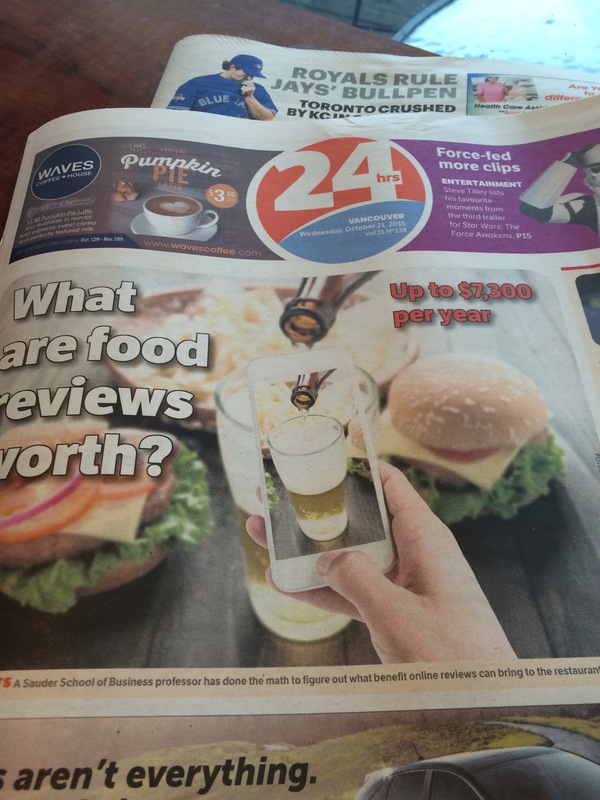 This is the idea that led marketing professor Chunhua Wu, out of the Sauder School of Business at UBC, to figure out just how much value restaurants get out of these reviews. And if you were a new person in Vancouver searching online, his findings suggest that the search just contributed $1.50 to the local restaurant economy. To arrive at that conclusion, however, Wu had to find people regularly using these sites, and how many actually visited the restaurants after reading the reviews. His answers were found in Dianping.com, the largest consumer review website in China, which gives users discount cards if they check in to an eatery. The findings suggested 15% of the users actually showed up to eat shortly after reading the reviews, based on about 5,000 users’ browsing habits for the top seven hotpot restaurants in Shanghai. At those restaurants, the average person is likely to spend $17 (prices converted from Chinese currency), and Wu calculated how much value each review reader, on average, contributes to the restaurants’ incomes, regardless if someone shows up — it was about $1.50. “We found it’s very interesting there’s so many online reviews but we don’t know whether consumers value this, or whether it would change the profitability of restaurants,” he said. The study is limited, however, in finding out how different types of reviews might impact whether customers show up, since he picked only the top restaurants. “The content is more important than the rating … it contains more information than just the numerical ratings, people read the messages and try to figure out how it can fit their own taste,” Wu said. Other questions include whether score ratings are consistent — if they aren’t, customers might not trust the review. Things like the “star status” of a reviewer and their accuracy also matter, as do the number of upvotes given to reviews considered more “useful” than others. Ian Tostenson, president of the B.C. Restaurant and Food Services Association, agreed with the author that reviews are more likely to matter if tourists are reading them. “The emphasis is on people if they are travelling to places, where there’s no reference point. They’re looking for something they feel is an independent point of information. They don’t have friends, they don’t have anyone to tell them — those online reviews, in that case, work better,” he said. All told, the average total each of the seven restaurants got out of people reading reviews was about $7,300 per year. 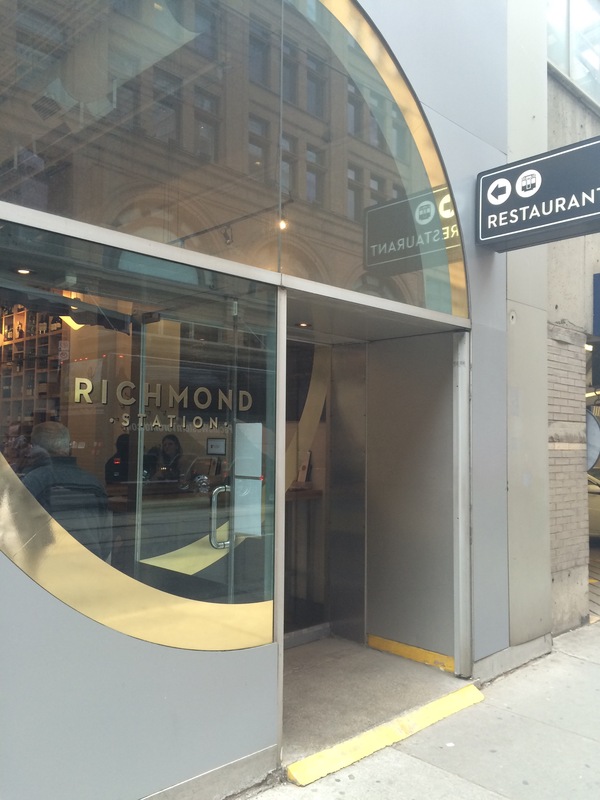 My travels took me to Toronto which finally offered me the chance to try Richmond Station and meet Chef Heinrich – Top Chef Canada season 2 champ. Richmond station is located in the heart of bustling Toronto across the street from the iconic and one of the oldest building in Canada The Hudsons Bay. The atmosphere is unpretentious and welcoming as if your sitting in between Chefs kitchen and a blend of traditional but contemporary restaurant / eatery. 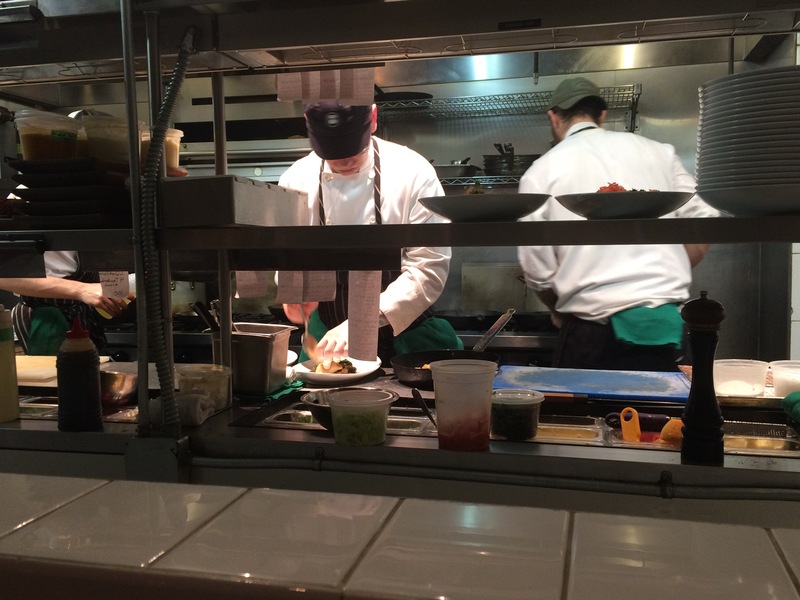 We opted for the Chefs Table as well as the Chefs tasting menu. 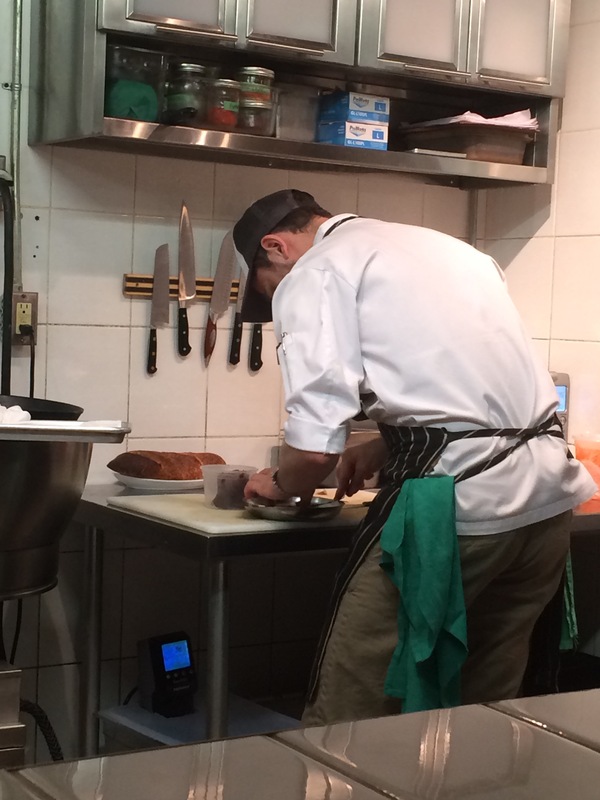 Chef Heinrich takes the time to great regulars and new diners alike and has almost a shy humble demeanor but extremely welcoming and friendly. You can definitely see that he has created a great team that are all bought in to his culture and demand for high quality and top notch ingredients. The fresh oysters were served with fresh grated horseradish, lemon and housemade cocktail sauce, hot sauce and some sort of Apple vinegar type sauce that was unique and very tasty. sliced lardo, bistro greens, pesto aioli, green goddess dressing. I have to admit that I don’t usually like radishes but when the magical talents of a culinary master transform ingredients to the next level I found myself wanting more! 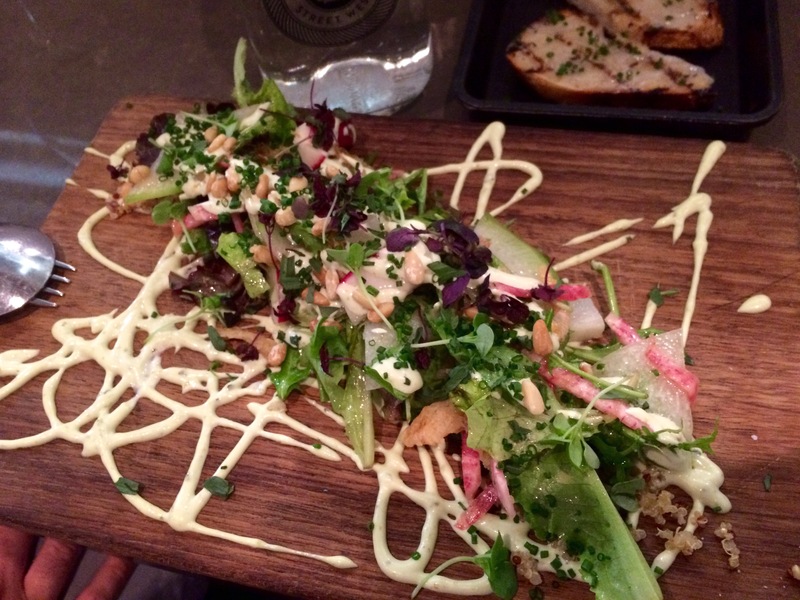 This fresh and lively salad was served with fresh grilled bread with lardon making the bread beyond tasty. 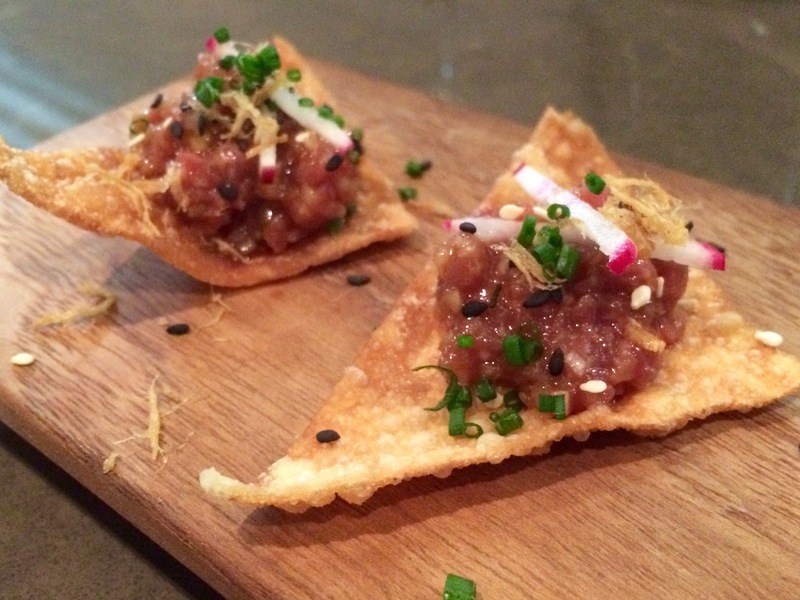 Served on wonton chips with pear, ginger & radish. 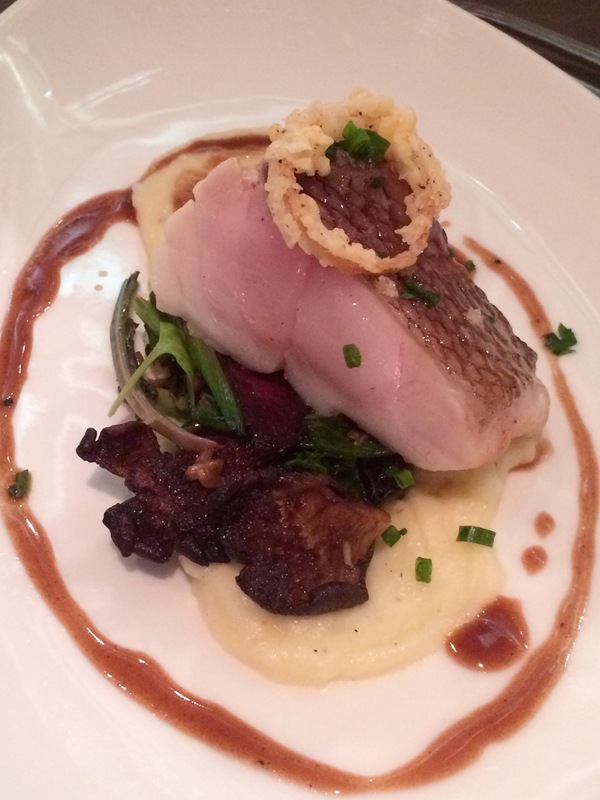 Next we had Slow cooked Rock Fish- the fish was perfectly cooked and uniquely prepared Sous Vide served with pommes purée, mushrooms, summer sausage and red wine beef jus. 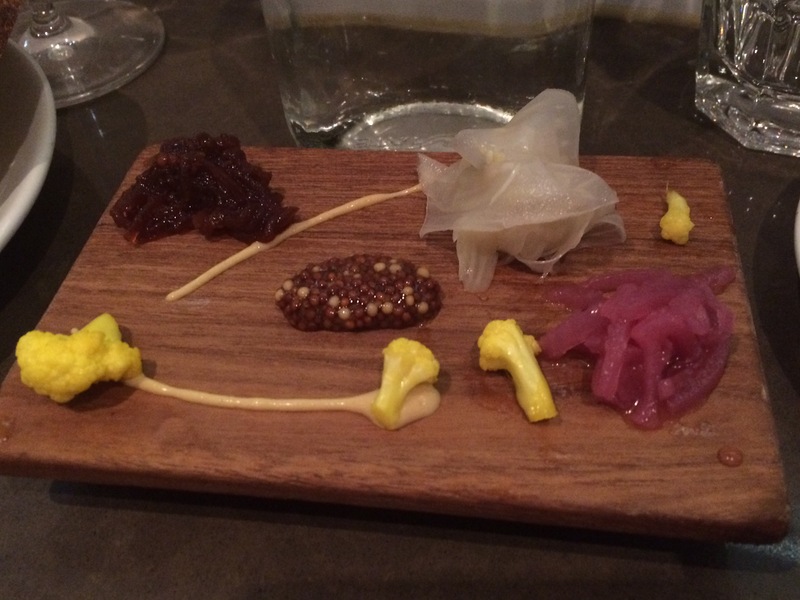 This dish was perfectly cooked and uniquely prepared. I have never thought of pairing beef jus with fish but I can tell you with all certainty that it worked gloriously! The lamb was masterfully cooked and prepared in two different cuts. 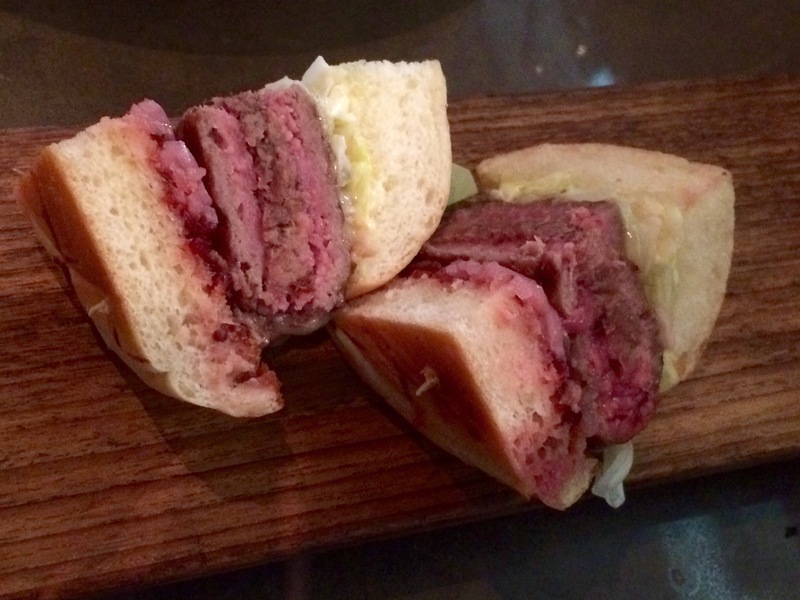 One was delecate and tender and the second cut was the belly and sinfully good. 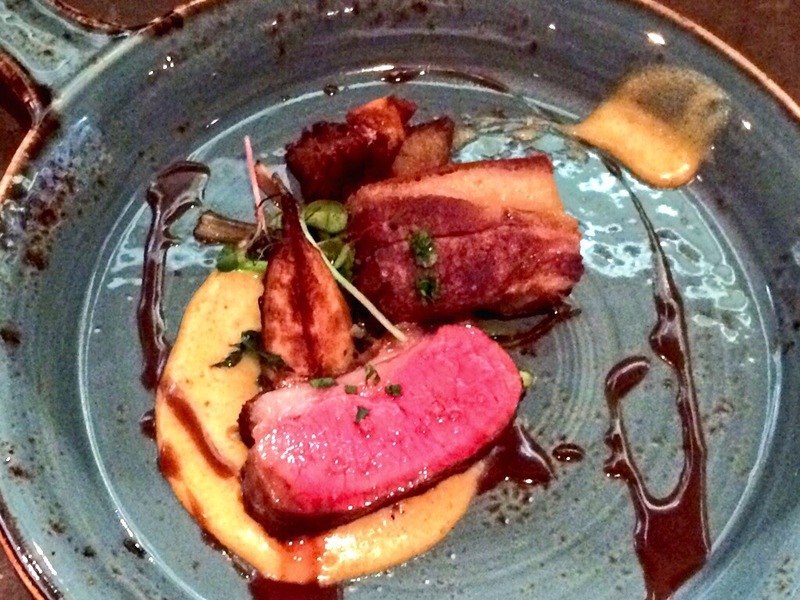 The lamb was served with a purée and accompanied with what also seemed like the red wine beef jus. Did I mention that we added the wine pairing ? We did and the best part of it was that your taken on a sipping journey that is masterfully paired with your culinary journey. To finish off the meal with had light sweet treat. Black Chocolate pudding and White Chocolate pudding. 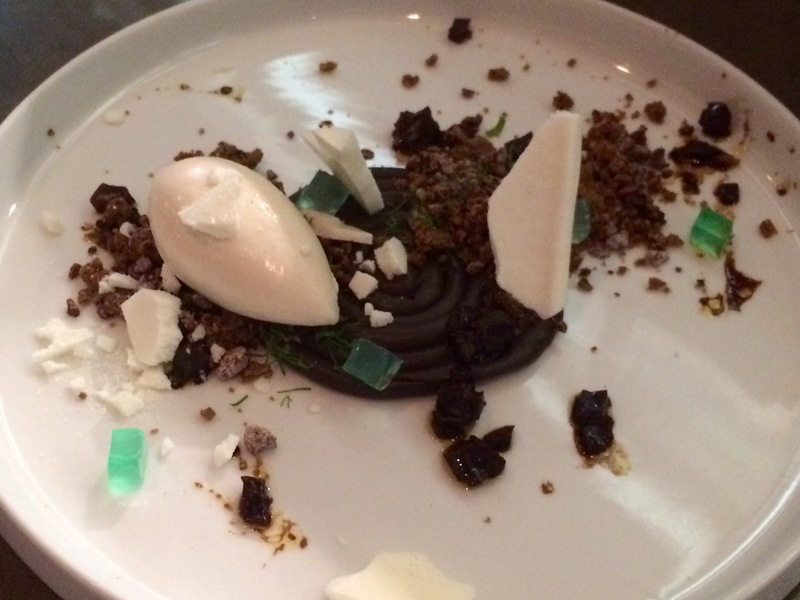 Served with fennel, coffee cake, mint jelly, pernod meringue, cocoa nib crumble, chocolate ice cream. A nice sweet treat to end a perfect tasting meal. Toronto is very similar to Vancouver when referring to how many fantastic new restaurants pepper the cities with unbelievably talented chefs. Chef Carl Heinrich and his team create a very comfortable spot to eat with friends, business dinners or just a great meal with your sweetie. The style of cooking makes me think of similar to a farm to table theory where you can tell Chef prides his creations by sourcing local quality ingredients as well as supporting the local wine industry. 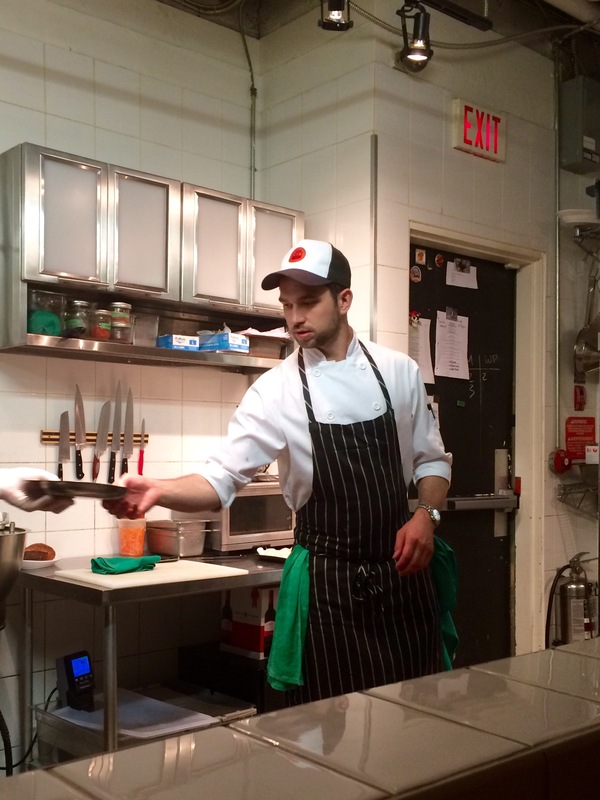 This eatery really is lead by a Top Chef Canada contestant – the winner in this case. No matter how high having accolade associated with your name is as well as the perception and expectation of your customers may already be…. Richmond station shine through in my opinion. The passion from the culinary soul shines through as you see Carl coordinate and looks over every dish leaving the kitchen! Happy Friday good foodie friends. 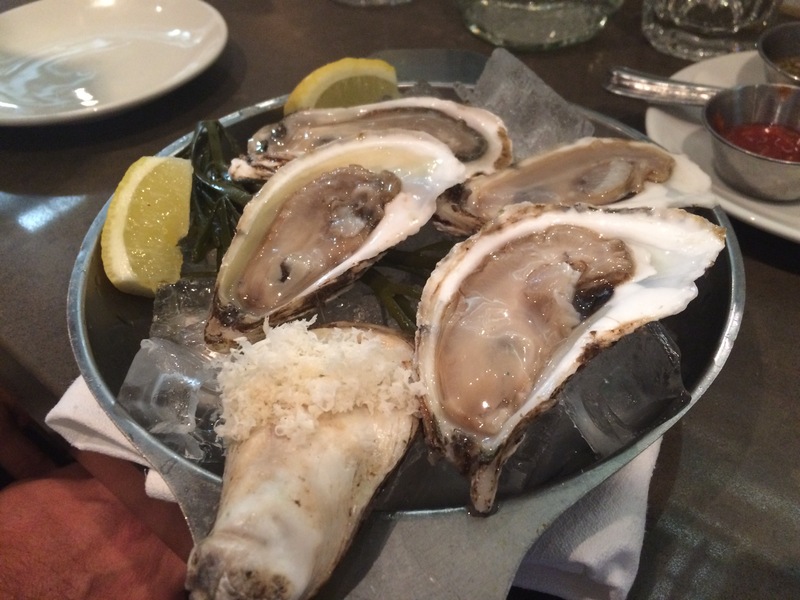 Take a look at this list from Thrillist – written by Kristin Hunt, thank you Tnrillist. 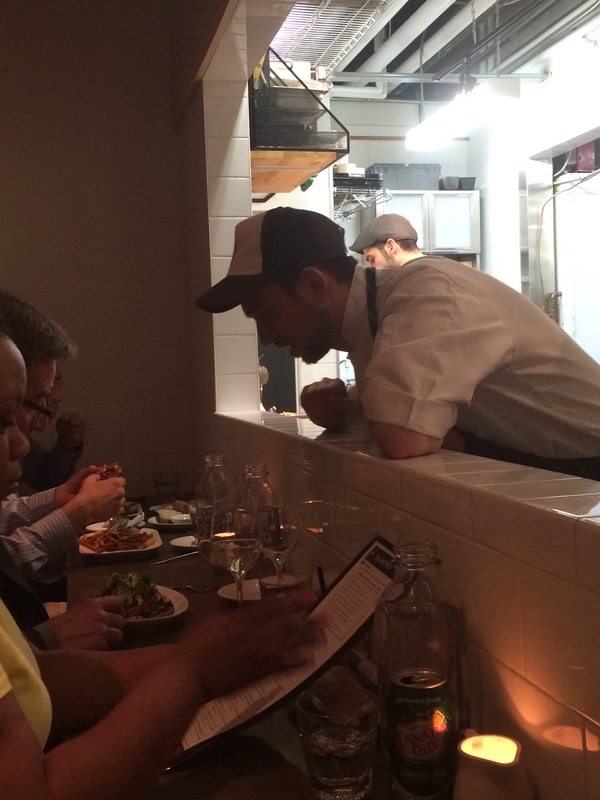 People love chasing restaurants with impossible reservation lists, but for some diners, a tricky table isn’t enough. No, they want to eat at a restaurant so exclusive, its very location is a secret. And it’s not just trendy speakeasies — dinner spots across the nation are hiding themselves in temples, gas stations, or even other restaurants to provide patrons with a grown-up version of hide-and-seek. Lucky for you, we hunted down a few key picks to save you the trouble, so it’ll be more like hide-and-seek where the other person is wearing a tracking device. Nestled in the back of Spanish master chef José Andrés’s The Bazaar, Saam smells of rich mahogany and features many leatherbound books — no, seriously, the place is styled a bit like Donald Trump’s study. The prix-fixe menu is always rotating and offers plenty of dishes you can’t get at The Bazaar, making this library exponentially cooler than P.S. 115’s. This Beantown pick is buried inside the beloved gastropub JM Curley, and advertises itself as an “adults only” destination. But that doesn’t mean a 7pm burlesque show; rather, it refers to the grown-up 1920s steakhouse vibes that would make a guy like Bogart feel at home, if he weren’t extremely dead. Though this spot’s relative secrecy isn’t as calculated as its peers’, the Canteen exists quietly within Flushing’s historic Ganesh Temple. Its eats have gained serious cred among New Yorkers in the know, and their prices don’t hurt, either — every order there runs under $10, making for some divine dosas. Normally pulling up to a gas station with your date would earn you a swift rejection, but rolling up to the BP station off Miami’s 17th Avenue is actually a good call, as it boasts a secret wine and tapas joint. At El Carajo, you’ve got a staggering 2,000 vinos to choose from, and everything from calamari to paella to pair them with. Trust us, it’s all way better than a BP hot dog and a handful of pills. It may be hard to keep po’boys a secret in their native land, but this place did a pretty good job by setting up shop inside the established watering hole Erin Rose Bar. Run by the unstoppable duo of Cam Boudreaux and April Bellow, the shop slings modern spins on the classic sandwich, and even manages to sneak in such non-canon picks as a Jameson grilled cheese. Because Andrés loves a secret restaurant almost as much as patatas bravas, the man has another bonus eatery hidden inside one of his more-established outposts, this time the Jaleo at Vegas’s Cosmopolitan. The single bar seats just eight, but that’s unsurprising given the serious $195-per-person, 15-course tasting menu. Included in that menu are these caviar and meat-wrapped “tacos”, as well as a gelled, slurpable sangria with watermelon and mint. Don’t let its entrance in the parking lot of a shopping center fool you — this “cave” is far fancier than your ritziest above-ground restaurants. Yes, even White Castle. Ladies and gents are expected to wear evening and semi-formal wear, respectively, to this swanky, subterranean spot, where the chef is CIA-trained and the art collection costs more than your life. Oh, and the wines in the “Sommelier’s Court” aren’t half-bad, either. 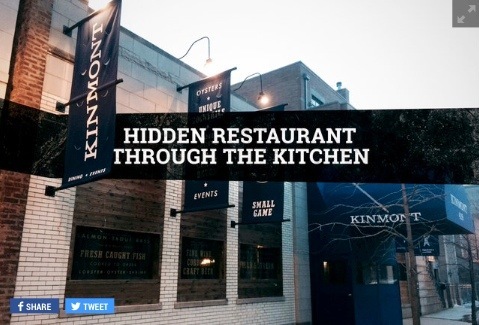 Serving as both a pop-up space and test kitchen, all within the walls of seafood-slinging Kinmont, Ampersand plays host to supper clubs, classes, and preview events from some of the city’s brightest culinary minds. It’s already booked through July, so if you wanna get in on a cookie tutorial or a ramen birthday bash, snag your tix now. The grandaddy of hidden restaurants, Safe House has been running since 1966, and takes its name quite literally with spy-themed decor all over the space. Everyone knows the unmarked address by now, so that cover is long blown, but you do need a password to get in. If you don’t know it, the doorman will have you complete a ridiculous task to gain entry. Anything worth acquiring requires a little work, anyways. Kristin Hunt is a food/drink staff writer for Thrillist, and sometimes likes to whisper passwords at the maitre d’ just to see what happens. Follow her at @kristin_hunt. Brought to us from Bon Appétite, a list worth watching or better yet worth trying out and sending along your feedback. VIEW: ALPHABETICAL | BY STATE or READ ABOUT THEM ALL by clicking on the link above! 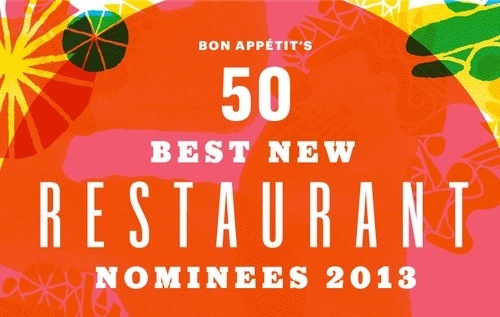 The World’s 50 Best Restaurants list has been announced, and the big news is of course that Noma’s three year reign as the number one restaurant in the world has come to an end. 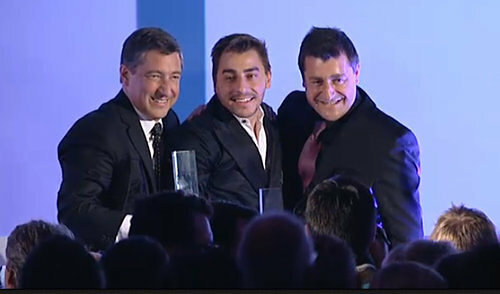 That title now goes to El Celler de Can Roca in Girona, Spain. 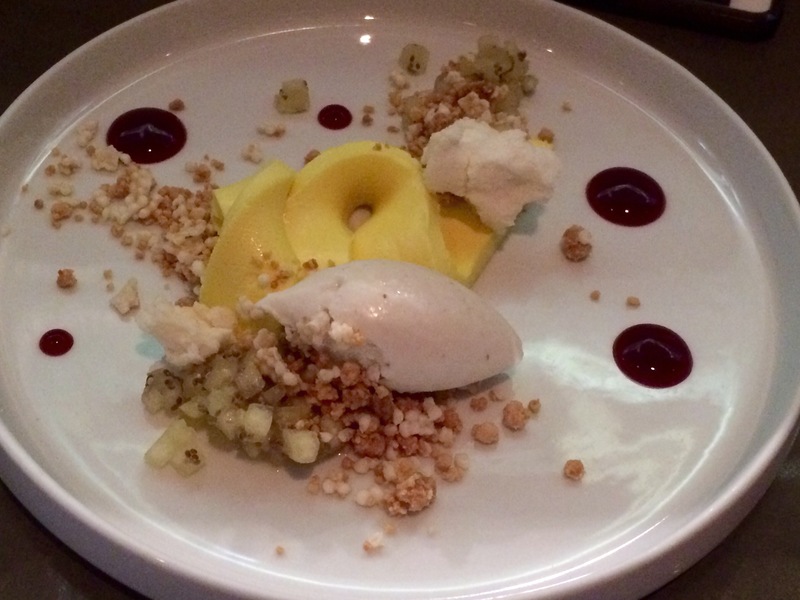 Noma holds tight at second, while third goes to Massimo Bottura’s Osteria Francescana. For those of you playing along at home, the list that leaked earlier today was correct. The United States went down from eight entries to six this year, losing Ssam Bar (#37 last year; David Chang isn’t even in London) and Manresa (#48 last year). However, Eleven Madison Park made major strides as the highest-ranked US restaurant, coming in at number five (up from 10 last year). Fun Fact: The restaurant is the work of the three Roca brothers. Joan is the head chef, his little brother Joseph is the sommelier, and the youngest of the brothers, Jordi is the pastry chef. The Rocas are coming out with a brand spanking new cookbook this year, and, oh yes, this is the first year their restaurant has taken that coveted number one slot. Fun Fact: Atala used to be a DJ. Fun Fact: Arzak’s daughter Elena, who also cooks at Arzak, won the S. Pellegrino Best Female Chef award for 2012. This post caught my eye as this rich bountiful wine region has so many great eateries…..which one or how many can we try? 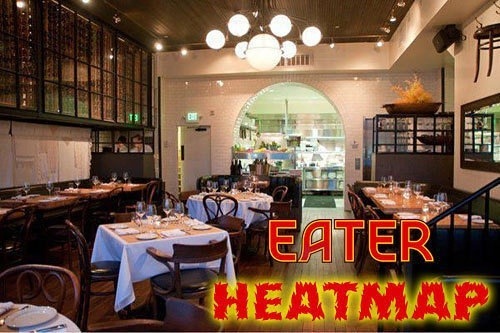 Please read this article on Eater National to see where the current hot spotsare. CINDY PAWLCYN’S WOOD GRILL AND WINE BAR Third time’s a charm for celebrity chef Cindy Pawlcyn, who has reinvented this St. Helena restaurant from sushi bar to Mediterranean grill, finally settling on what she does best: California-fusion comfort foods that include Chinese chicken barbecue duck breast, crab rolls, vegetarian enchiladas, baby back ribs and buttermilk biscuits, wood-fired pizzas, and burgers. Locals just call it CP’s, and know that the eggplant fries (kept from a previous menu) are the best way to start the meal. SPEAKEASY A favorite of industry folks, late-night revelers and anyone with serious munchies after midnight, this tiny bar and patio proffers calories-be-damned comfort food until 2 a.m. Best bets include lobster and bacon mac, Croque Madame, pork belly tacos and jalapeno poppers that come with a warning and a glass of milk. 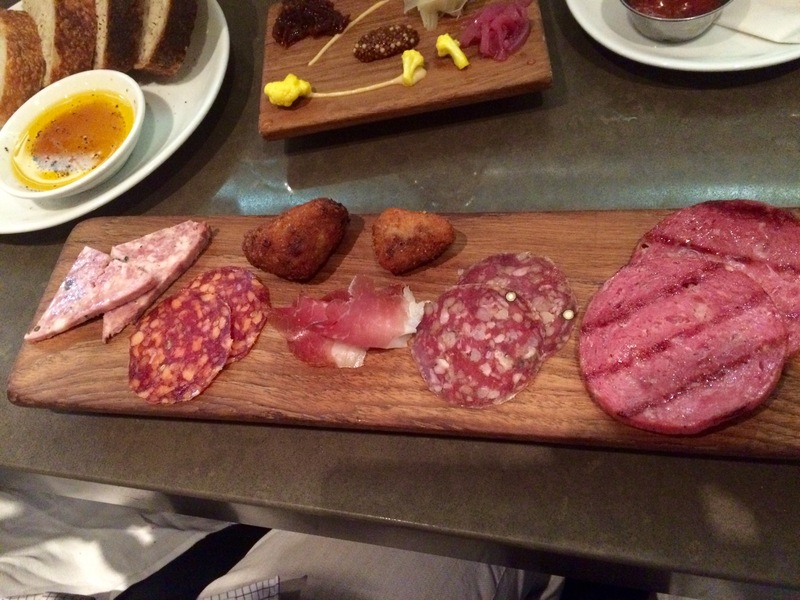 Thank you Eater.com… Visit their web page for the full article posting. While traveling to Munich you will find a great little town just a few KMs outside of Munich, Planegg. In town is a nice boutique style hotel and Ristorante. As soon as you walk into the great spot you will hear the warm accent of the Italians greet you and the great smells that all good Italian restaurants lure you in with. There is a great patio that the interior dining room just seems to flow into with the great open concept dining room with full open sliding doors. It is a little slice of heaven so sit and enjoy. 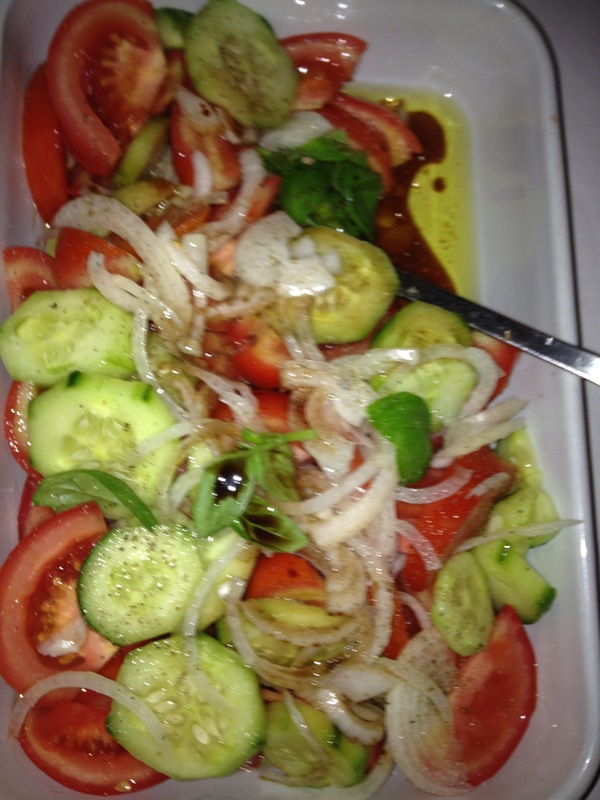 On a warm summer night enjoy a refreshing Tomato, cucumber and onion salad with olive oil and balsamic dressing. Next was a bowl of penne in a tomato rosé sauce with fresh tomatoes ad chunks of fresh salmon and fresh basil. 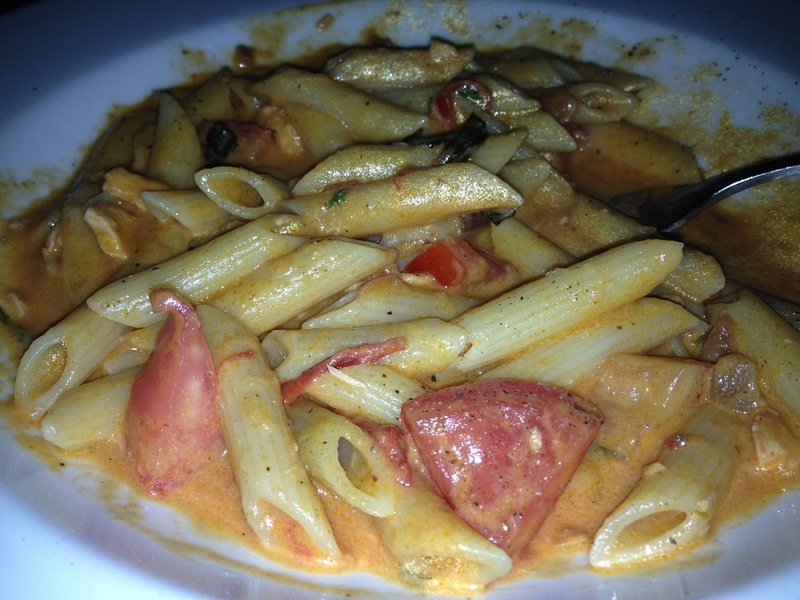 The pasta was fresh and full of flavor profile…… An excellent meal to end off a long day. 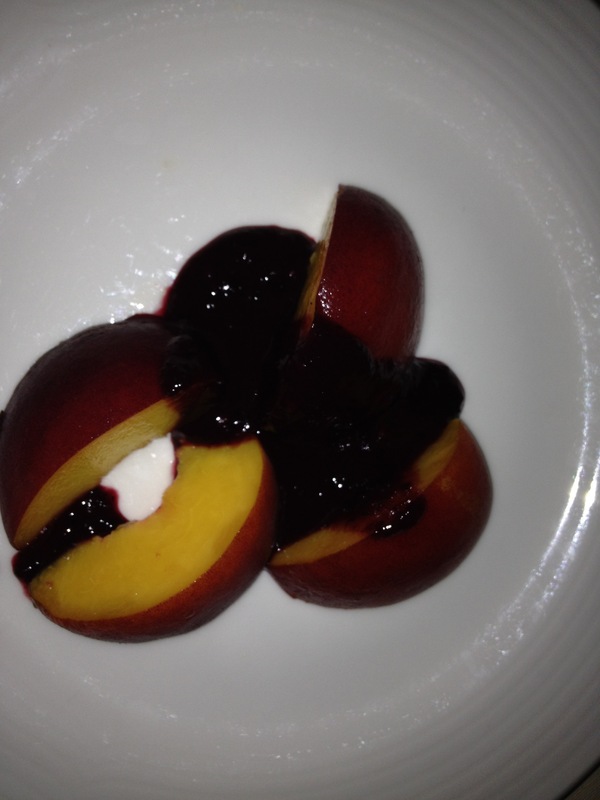 To freshen up the palate a plate of fresh cut peaches served with a fresh and flavorful blueberry compote. Light and fresh to finish off a great meal. The best part of this smaller town is the charming setting peppered with nice little shops and eateries. Just down the road you can find a bakery offering fresh pastries of the day along with beautiful breads with the flavors of Bavaria in mind. There is also some great little spots for some German Brew and schnitzel so strolling through the streets of Planegg you will surely find a nice little spot to enjoy. 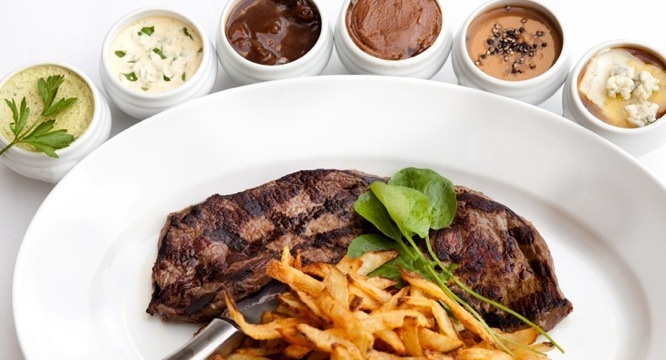 Try La Terrazza if you happen through Planegg and enjoy the Italian charm that this great little spot has to offer. 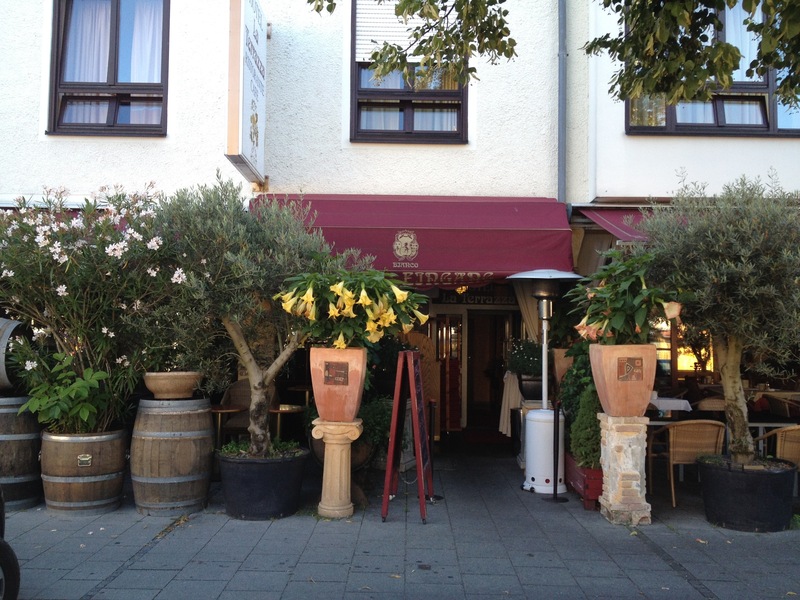 Great flavors and service with a smile and a little taste of Italy in Bavaria. Traveling to Las Vegas and wonder where to eat? Loaded question I know but sky’s the absolute limit! 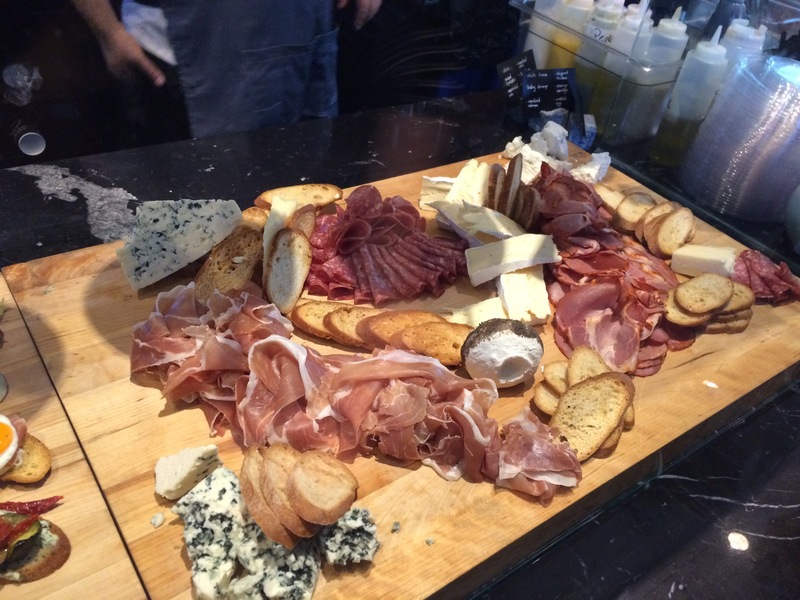 Your choices are abound and really no matter what you do you could not get to all of the foodie treasures that Las Vegas has to offers! One posting can’t even start to lay it out easily and accurately so let this be the beginning on a new Vegas eatery section on my new blog. Coming out will be recommendations or the following sections and as all good restaurants grow, expand and delight at different times…..always check back for updates and new postings. Located in the Paris Hotel right on the strip. Book before and then when you get in line let them know that you would like to sit on the patio. Think of this as a whole experience and enjoy the perfect view of the Bellagio water show while your taste buds blossom to the tastes of the classic French bistros offerings. Did I mention the bonus of people watching! Truly the best entertainment between the water show and the unique and wonderful characters that grace the streets of this vibrant city. 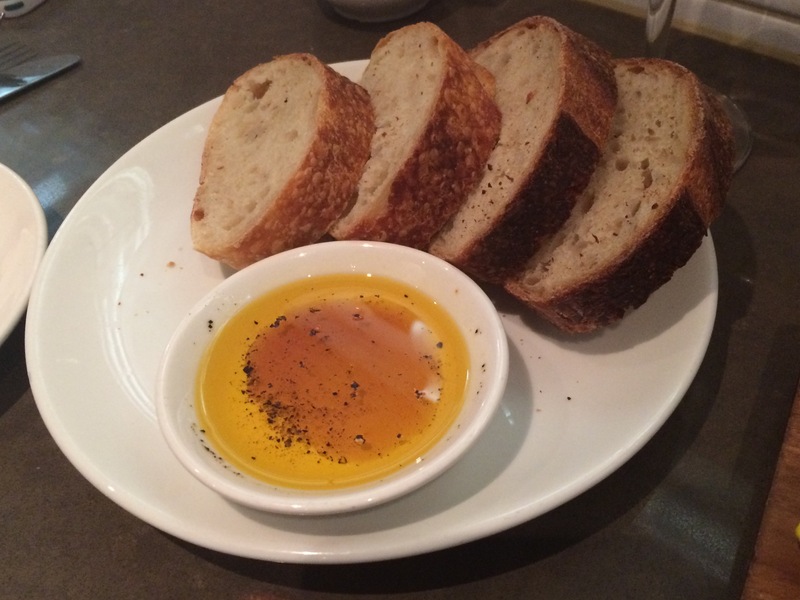 They have a nice wine menu and a very tasty food offering for many different tastes.. Check back for updates regularly for new gems for any occasion.